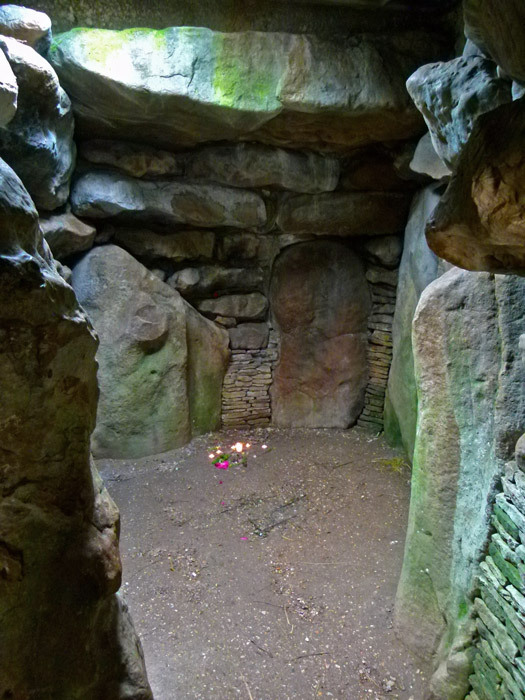 Tumuli, tombs or burial chambers, in varying shapes and sizes, litter the British Isles. 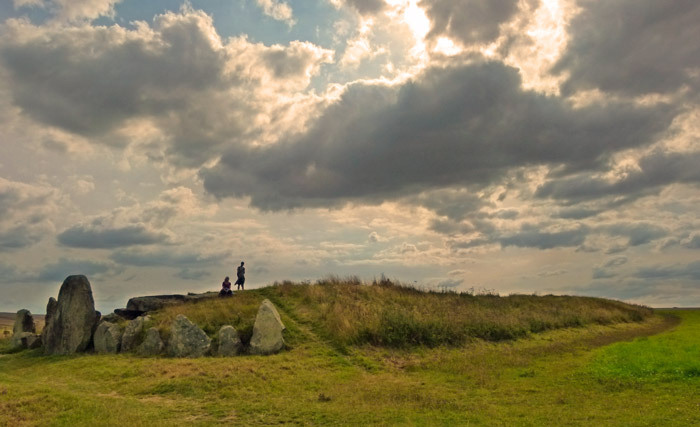 Long barrows are (roughly) rectangular tumuli, ranging from about 60 feet to more than 300 (28 – 100 metres) in length, usually with a stone (or wood) burial chamber at one end, the whole covered with soil and rubble dug from parallel ditches either side. More than 300 long barrows have been found in Britain. They were built in the Neolithic (‘new stone age’) period and can often be relatively easily identified as small whale-back humps in the landscape, out of context with their immediate surroundings. The majority are in the southern half of England. 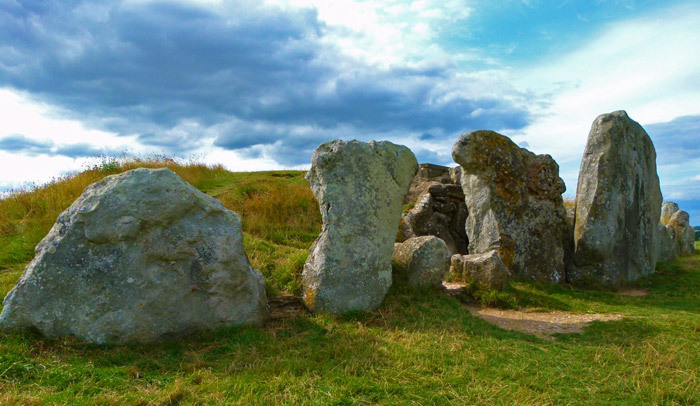 West Kennet Long Barrow is one of an extraordinary number of monuments from the Neolithic and Bronze Ages in the area around Avebury, in Wiltshire. The purpose of many of these ancestral left-overs remains a mystery, though the entire complex has been termed a ‘sacred landscape’ and its evident importance is further recognised by having World Heritage Site status. There are some 14 burial mounds alone within a 3 mile radius of Avebury village; but you can actually go inside the one at West Kennet. It’s an easy walk there along a country path from the main car park in Avebury, passing strange Silbury Hill along the way. Then, near a lay-by on the A4, there’s an uphill walk of about ½ mile south to the barrow. You can’t help but wonder at how many feet have trod the same path before you, and what ceremonies have taken place there. The size and form of West Kennet Long Barrow is appreciated as you get closer and see it emerge, an ancient, slumbering, thing along the crest of the hill ahead. 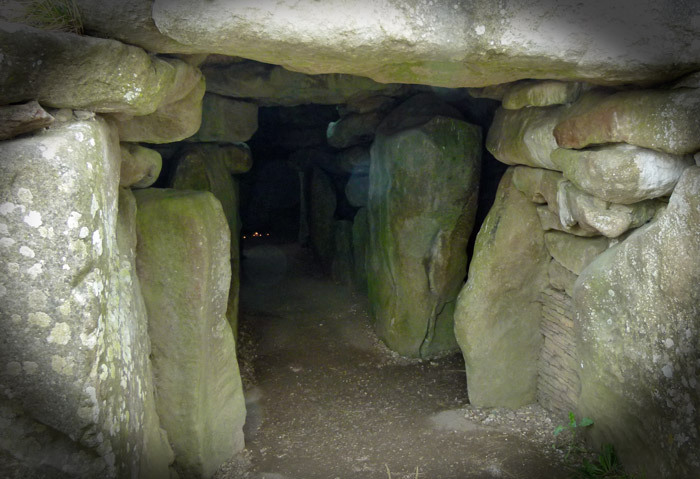 West Kennet Long Barrow is one of the largest long barrows in Britain – approximately 328 feet (100 metres) long and about 8 feet (2.4 metres) high. It was constructed sometime in the 37th century BC (3,700-3,600 BC) and is older than Stonehenge or the Great Pyramid of Giza. Even now, it would be a major project to build it. West Kennet is a chambered tomb, created from columns of massive sarsen stones (a local sandstone of the same type used at Stonehenge), roofed over with other sarsens on top. Smaller stones of limestone were brought from a site 20 miles away. There are two chambers either side of a central corridor and a chamber at the end, 5 chambers altogether, about 43 feet (10 metres) from front to back. A row of large upright sarsens, which once sealed the chamber, stands at the entrance. Here was a small forecourt, which perhaps had a ceremonial purpose. The barrow is aligned roughly east-west (as many are), with the entrance at the eastern end, and once held the remains of at least 46 people, ranging from babies to the elderly. We do not know how much damage has been caused by ignorant, or misguided, vandalism. Records show that in 1685 a Dr Toope (aka ‘Dr Took’) from Marlborough disinterred a number of human bones from “which I made a noble medicine that relieved many of my distressed neighbours.” The mind boggles. More careful, scientific, excavation was undertaken in 1859 and again in 1955-56, during which the remains of the 46 were found. Most (about 36) of the burials took place relatively soon after the barrow was built. It was then filled in with rubble and debris, including animal bone and flint tools, and the rest of the human remains, mostly of children dating from about 3,300 – 2,500 BC, were discovered amongst this. Only a selected number of the Neolithic population were interred in barrows. We do not know why, or what happened to the majority after death. It was also common for burials to take place after the flesh had gone from the bones, though it seems this was not the case at West Kennet. However, the bones had been re-arranged and some of them also appear to have been removed entirely. It is of course a curious thing to enter a tomb. At what stage, I wondered, would this be considered macabre, or in bad taste? Perhaps it is in any event. It is not dark; these days, sky-lights have been set into the roof so that you can see without the aid of a torch. In the far chamber, someone had set out a pattern of scented candles, so the place was infused with a smell closer to that of a certain style of gift-shop than a grave. Do they do that every day? I wanted to know. I assume it was unofficial and not sponsored by English Heritage. I touched the stones, thinking about my ancestors who had heaved them into place almost 6,000 years ago. Mrs Britain took one look inside and didn’t like it one bit, though whether it was the cheap candles or something else I couldn’t say. 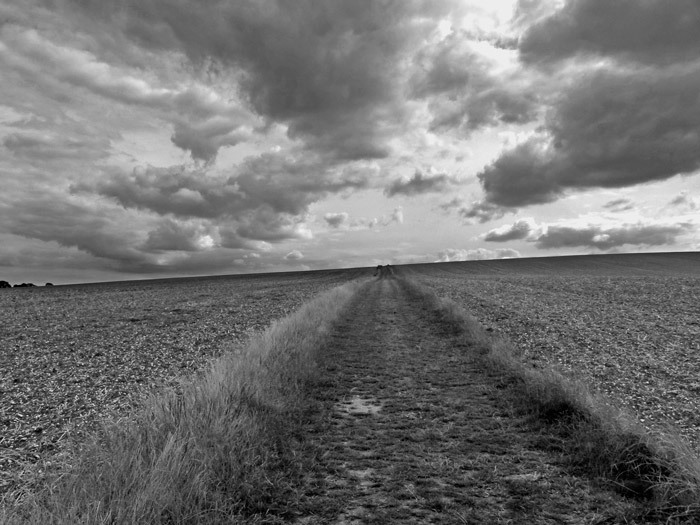 While she sat outside, taking in the Wiltshire countryside, I hung back: though there was nothing to see – just the stones. 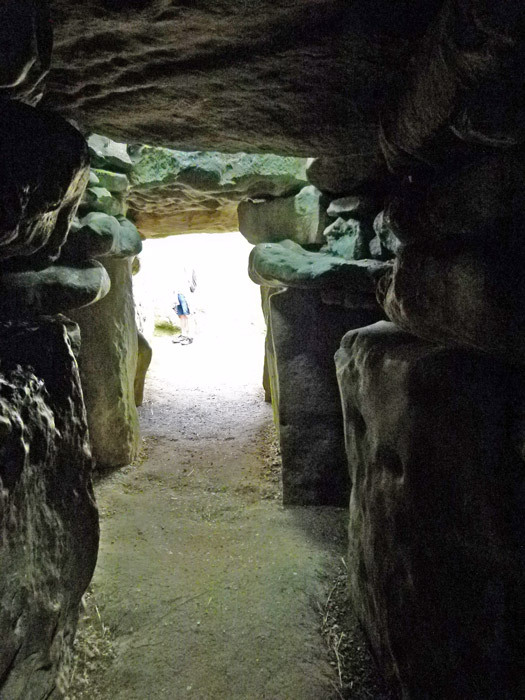 By the way, it is said that West Kennet Long Barrow is visited at sunrise on Midsummer’s Day by the ghost of a priest and a large white hound with red ears. This sounds like an ancient tale of the otherworld to me – possibly Celtic. 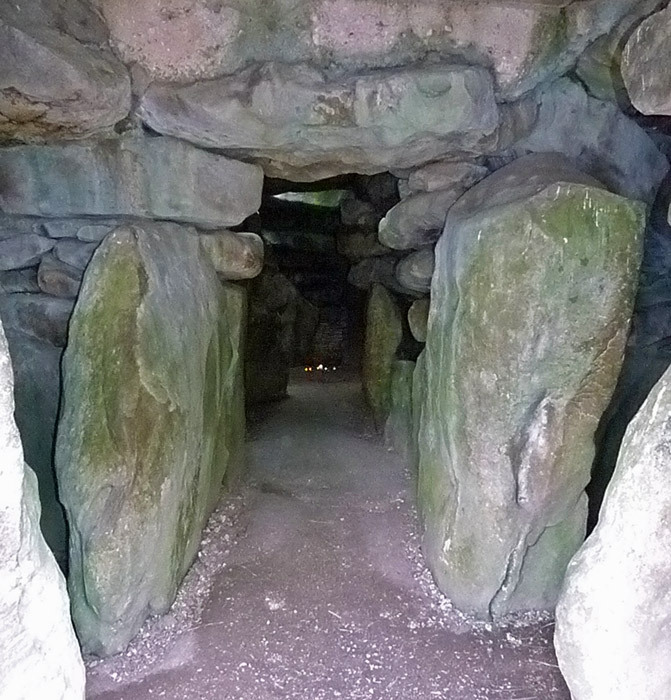 Go to A Bit About Britain’s directory for more information about West Kennet Long Barrow and other prehistoric sites. How did I miss this one? I think I agree with you about the candles. There’s a useful map on the post about Avebury, CP – http://bitaboutbritain.com/avebury-henge/ Failing that, West Kennet Long Barrow is almost immediately due south of Avebury, on a footpath off the A4. There is a layby there, but it’s an easy walk from Avebury, past Silbury Hill (which I’m pretty sure you’ve posted photographs of) to the A4. I am in awe of places like this where we have no sense of what the community was like to get together to make such a structure. I’d like to visit this one someday. I am sure West Kennet Long Barrow featured prominently in a book I read and reviewed about 2 years ago. If you are interested, you can find the review here. Your post reminded me of how fascinating I found that book in particular, and how in general I am drawn to old monuments. Amazing to think of how people so long ago built these. West Kennet, Silbury Hill and Avesbury are my favorite places in England. No mater where we’re staying we take the time to drive there. It’s interesting that the tone of your writing implies you have respect for the ancestors who heaved the stones into place, but rather less so for the modern day folk who want to use the site for worship. Pagan ceremonies at prehistoric sites are simply carrying on a very long tradition (though you’re right, EH don’t approve). There’s a lot of evidence that Beaker Culture and Bronze Age people re-used neolithic mounds for their own burials, So current day Pagan rites (such as the ‘cheap’ candles you found) are justifiable in my opinion. Ah, HA – is nothing sacred? No, it isn’t. But I’m puzzled that you have seen a lack of respect for pagans there, because I had no idea that they use scented candles (I need to look into this) – for all I know, it could have been the cleaners, or a love-lorn teenager. Whoever it is, maybe they should invest in a better brand of candles. 🙂 I would perhaps write more seriously if it was suggested that these sites were reused for their intended purpose. Any old candles – it’s the flame that counts. Well, it’s all the flame to me.